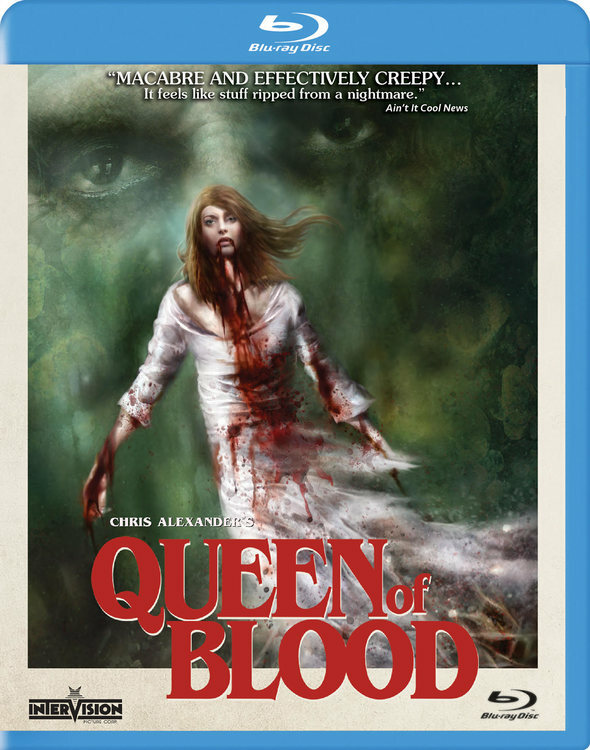 QUEEN OF BLOOD (2014): Minimalist Obsessiveness Goes Back To Nature – Schlockmania! With Blood For Irina, writer and musician turned filmmaker Chris Alexander established a pretty distinctive and somewhat controversial style: it was image-driven, dialogue-free, referenced the work of Jesus Franco and Jean Rollin while sidestepping the overt sexuality of those films and was made in a lo-fi, micro-budget style that wore its rough edges as a badge of pride. Alexander quickly returned to the character of Irina for Queen Of Blood but the result isn’t a sequel. Instead, you could call it an alternate-world cousin to Blood For Irina… and its style shows that Alexander remains determined to pursue his muse in a no-compromises way. Queen Of Blood begins with Irina (Shauna) crawling out of the muck of a pond. At first she is taken in by a woodsman (David Goodfellow), who cleans her up to presumably make her into frontier wife material. She responds by tearing out his throat, the first act in a reign of terror that finds her wandering the countryside and killing its residents for blood. There is also a murderous preacher (Nivek Ogre) for Irina to contend with – and a pregnant widow (Carrie Gemmell) who Irina will have a special purpose for when they cross paths. Like Blood For Irina, Queen Of Blood presents its artsiness to the viewer as a take-it-or-leave-it proposition. It revels in its own dirge-like rhythms, rough-hewn video imagery and its lack of interest in drawing in the viewer through plot or characterization. The result often feels more like a video installation piece than a feature film. In fairness to Alexander, this defiance towards the accessible and commercial is deliberate… but the experience is closed-off and not terribly inviting unless you share his mindset and interests. If you can find your way into Alexander’s web of obsessions, there are some interesting differences to be noted between Queen Of Blood and Blood For Irina. The new film foregoes rundown urban landscapes in favor of a return to nature, with the new version of Irina becoming a force of nature that uses those around her as fuel to create her own version of the world. 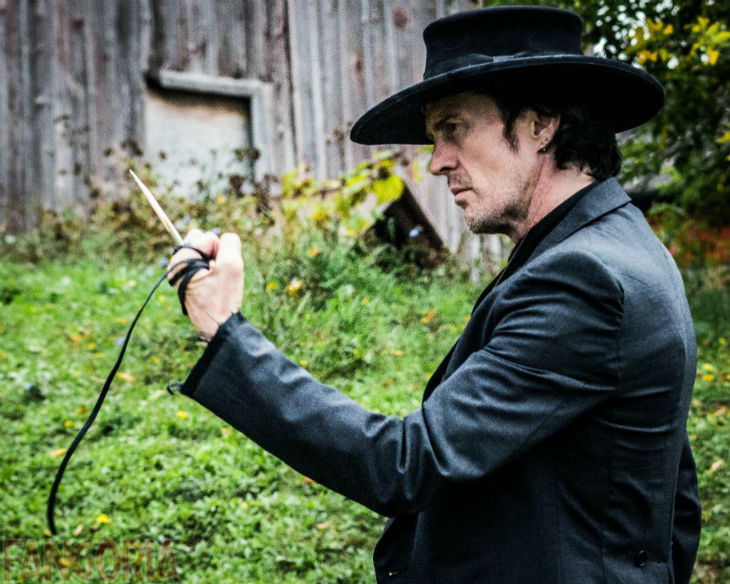 Henry brings the new persona to life in a way that complements the film’s style – and Alexander’s one-man-band style ensures that his style remains consistent. Ultimately, the appeal of Queen Of Blood for the individual viewer will depend on how closely Alexander’s hermetically-curated set of inspirations and fixations syncs up with their own interests. Blu-Ray Notes: This was recently released to blu-ray via Severin sublabel InterVision. The transfer does as well as it can do by material shot on consumer-grade digital gear: colors are pretty solid throughout but detail depends on the camera used (some parts were shot using an iPhone) and how blown out the imagery is in the shot in question. Audio for this transfer is LPCM and sounds good: the soundtrack consists mostly of Alexander’s atmospheric original score and is a solid mix. InterVision has also included a number of extras on this set. The first is a solo commentary by Alexander. He name-checks his influences, defends/explains his lo-fi aesthetic and offers plentiful production tales, including descriptions of his guerilla filmmaking tactics. You can also watch the movie with a brief intro from Nivek Ogre. Two alternate endings are included for the film: one that is a slightly longer version of the existing and another that links this film to its predecessor. A trailer for the film simply consists of one shot from the film, which is becoming a regular Alexander promo tactic. Two extras offer brief behind-the-scenes explorations: “Gore Gaffes” offers just over three minutes of comical mishaps involving shots using blood and “Directing Ogre” is around five minutes showing how Alexander worked with the titular actor. That said, those moments are more interesting for how the camera microphone reveals the loose yet fast-moving atmosphere behind the camera. Finally, a Q&A session from the film’s Toronto film focuses mainly on Alexander telling production tales, which give it a certain amount of overlap with his commentary, but you do also get to hear his actress Shauna Henry speak, too. The final extra is the biggest: Blood For Irina is included in full as a bonus, thus making this one-stop-shopping for those who want to check out Alexander’s currently available films.